Marcus and Nicholas Young from Heathmont have a very interesting business - Incarta IT. What if there was a technology in hospitals that could predict if a patient was going to have a heart attack, even as much as a day before a potential incident, and all using artificial intelligence? 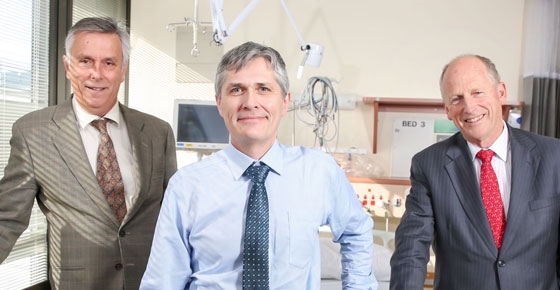 It sounds like science fiction but Incarta IT has already developed it and it’s being trialled in Victorian hospitals in Melbourne and Shepparton right now. A formal clinical trial is underway of a new technology that is processing clinical data – primarily pathology data – in real time to predict the likelihood of an adverse event such as a heart attack. While he stresses their system is embryonic, results to date suggest the system is working and that a high percentage of at-risk patients can be successfully identified 24 hours before such an incident. The cost of providing an intensive care bed is upwards of $4,000 per person per day. If Incarta’s system can save one hospital 100 days a year by treating “crashes” before they happen it will have saved that one hospital the better part of half a million dollars. There are about 180 intensive care units in Australia and New Zealand. Incarta’s expertise in the health-data space has lead it develop ALARTA, a software program to manage Intensive Care Units (ICU). Incarta is also producing a system called CLICKS, or Clinical Image Capture and Storage. It’s a secure mobile phone app for doctors to capture and store clinical images. The convenience of mobile phones is leading doctors to use them to easily photograph patients in consultations, but the Australian Medical Association has recommended against the practice, citing security concerns. CLICKS is an answer to that, providing a closed, encrypted system where doctors can safely share images with other authorised practitioners and automatically include them in patient records. To find out more about Victorian and local government assistance that may be available to you, visit Business Victoria. This article was originally published on the Faces of Small Business website.